Charles Hanna's "The Scotch-Irish, or the Scot in North Britain, North Ireland, and North America" is a vital source for anyone interested in the history of the involvement of Scottish settlers in Ireland or North America. Published in two volumes in 1902, and running to more than 1,200 pages, this resource is packed with details on the origin and migration of Scottish people over the course of twelve centuries. The author did not intent to produce a history of the Scotch-Irish people, as 'such a work would require more time and labor than have been expended upon the present undertaking' (vol. i, p. v). Nonetheless, Hanna succeeded in providing an impressive, lucid and readable account of the principal developments in Scottish, Irish and American history and Scots Irish influenced philosophical thought until the end of the seventeenth century. Volume one of Hanna's work focuses on Scotland and Ireland, and there is little that is not detailed. The plantations of the early seventeenth century, both the private plantations of Antrim and Down, and the state backed settlement of the west-Ulster counties, receive fulsome treatment. Researchers will particularly appreciate that Hanna quotes extensively from source material that can now be difficult to obtain, including George Hill's Plantation of Ulster, Nicholas Pynnar's 1619 survey on the progress of the plantation and from various accounts in the State papers. The development of an organised Presbyterian church during the 1640s is also recounted, and readers unfamiliar with this ecclesiastical development will learn that 'on the 10th of June, 1642, the first regular presbytery of the Church in Ireland was constituted at Carrickfergus' (vol. i, p. 567), and that state payment to Presbyterian ministers, the 'regium donum', commenced in 1672 (vol. i, p. 580). The Williamite Revolution, which included the siege of Derry and the Protestant victory at Enniskillen, also receives extensive treatment (vol. i, pp 582-603). In volume two, Hanna shifts the focus to North America, and concentrates on the development of Scottish settlements in New England and along the eastern seaboard during the seventeenth and eighteenth centuries. Early censuses and surveys are transcribed, which will assist researchers interested in the development of Scots Irish settlement at this juncture (vol. ii, pp 94-130). Extensive appendices provide important additional information, including the lists of the principal Scottish names (vol. ii, pp 422-440), the location of Scottish families in Ireland (vol. ii, pp 518-527) and a detailed lists of Scottish peers, lords, office holders and members of the Scottish parliament, until it was dissolved in 1707 (vol. ii, pp 440-518). 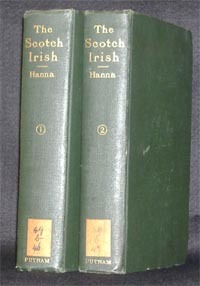 Like most of our digital titles, Hanna's "The Scotch-Irish, or the Scot in North Britain, North Ireland, and North America" is fully searchable, and researchers with an interest in human migration and in the history of Scotland, Ireland or North America will find this an extremely useful resource and thought provoking source, which will stimulate future study.